Click the pic to order a signed copy! 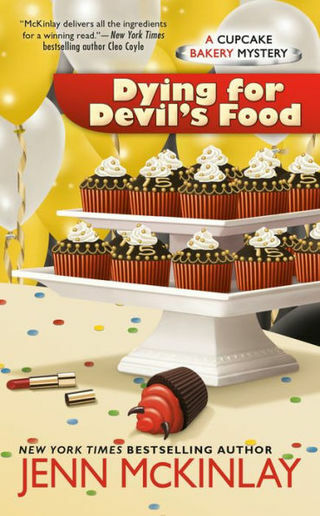 Book Release: On April 5th, the latest Cupcake Bakery Mystery VANILLA BEANED hits the shelves! Woo hoo! As the cupcake crew heads to Vegas to open their first franchise, it’s all cupcakes, Elvis, and an elopement -- what more could you want? Phoenix, AZ: April 9th from 1-3, I will be signing Vanilla Beaned while my good friend Paige Shelton signs The Cracked Spine at the Barnes and Noble at Metro Center (10235 N Metro Parkway East Phoenix, AZ 85051). 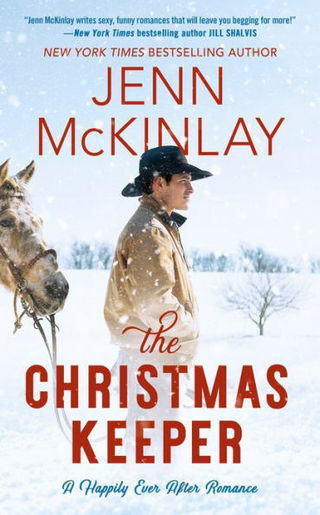 Book News: LOTS of book news to share! Yay! 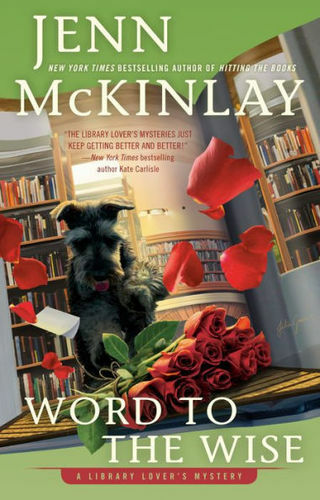 Recently, I sold two more Library Lover’s mysteries and two more Cupcake Bakery mysteries, and I decided to give women’s fiction a whirl and sold a three book series that will launch in June 2017 with the title ABOUT A DOG. I am crazy excited for this series to debut and I hope you’ll join me for my romantic comedy shenanigans set in Maine. Marriage. After the “I dos”, nothing is quite what you expected when you went skipping down the aisle in your big white meringue of a dress, gazing into the eyes of your Prince Charming as if he was the greatest thing since the invention of voice texting, is it? Within days, weeks, months (if you’re lucky) cap-on-seat-down-who-is-hogging-the-bedcovers issues begin to wiggle in between you and your spouse like the puppy or kitten you thought would be a great idea to adopt three months into your marriage, but after having to clean up after said fur baby for the millionth time, you start looking at your partner as if you never really knew him at all. Or was that just me? Hub and I were married after just one year and four months of dating. When it’s right, it’s right. Right? Needless to say, we each brought a lengthy back story to the marriage, but that was okay because our mantra from day one was “Love Conquers All.” And it did conquer all, taking on a mortgage, puppy adoption, birthing two hooligans (mostly me), several years of coaching little league (mostly him), the recession which came with unexpected career changes, parent teacher meetings that were, oh, let’s go with alarming, a handful of midnight emergency trips to the children’s hospital, vacations where we looked like pack mules as we ran through the airport together with enough stuff strapped to our bodies, including hooligans, to survive a zombie apocalypse, and one particularly scary flight where we were sure we were going to die - the hooligans were the only people on that plane whooping it up like they were riding a bucking bronco, the rest of us were just trying not to throw up. Those are just a few blips on the highlight reel, there is more, so much more, but that’s not the point, if I even have a point, which is always debatable. In a nutshell, marriage is hard, wicked hard. It has ups and downs and spin you arounds and then one day, you look at your Hub and realize you have been with this person for a third of your life, and it’s been the best third of your life, yes, even with the downs, and you want to celebrate. So, what do you do? Well, if you’re me, you ask your Hub to elope to Las Vegas with you and renew your fifteen-year wedding vows in a pink Cadillac with your hooligans as witnesses and Elvis officiating, because…Elvis. So, that’s what we did. And so it was fifteen years to the day, at A Little White Wedding Chapel in Las Vegas, Hub and I renewed our vows, promising again to love each other for as long as we both shall live. The hooligans witnessed it, Elvis sang, we all danced, and later there was a chocolate fountain and cake! No, I did not do all this just for cake, even though some people might suspect as much. And, yes, I did plan on writing an elopement into the cupcake bakery mystery series and, sure, a lot of research was done on this trip, but still, I got to marry my Prince Charming for the second time, which reminded us both that all of the cap-on-seat-down-who-is-hogging-the bedcovers stuff is totally worth it. Was it ridiculous? Oh, yes. Was it hilarious? Yep, that, too. Was it joyous? Very much so. Was it one of the best days ever? Totally. The thing about renewing our vows with our children beside us was that we got to relive one of the best days of our life with the people who matter most. Plus, weddings are stressful but elopements are easy-peasy. I highly recommend it! 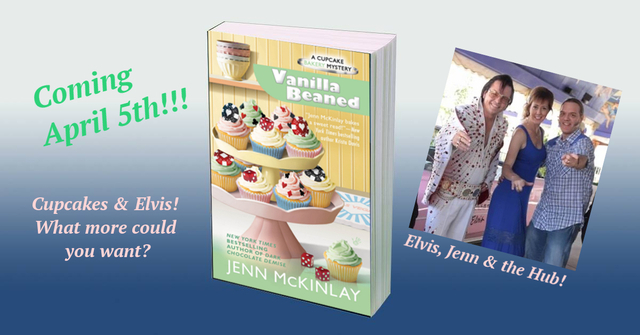 So, if you’re curious as to which couple might be the elopers in the Cupcake Bakery mystery series, assuming, of course, that someone does elope in the latest book, be sure to pick up a copy of VANILLA BEANED and join Mel, Angie, Tate, Marty, and Oz for their latest adventure! As always, thanks for letting me visit with you and for being the BEST readers EVER!